Having the annual WEFTEC conference in Chicago, just two weeks before the much anticipated Election Day can be a blessing or a burden. The Water Environment Federation is taking advantage of the situation to feature two sessions on the perspectives and challenges facing the new Administration -- whether it be John McCain or home-grown Barack Obama. At about 10:30 a.m. on Oct. 21, Moderator Jack Conaty of Fox News Chicago will direct a lively discussion on "What Will McCain or Obama Really Do for the Environment?" with panelists U.S. Rep. Daniel Lipinski (D-Ill.), Marianne Horinko, president of The Horinko Group, representing the McCain campaign, and Cameron Davis, senior adviser for Obama for America. This discussion will be held in Room S406a at McCormick Place in Chicago. Another session at 1:30 p.m. will consider "Climate and the Water Environment." According to WEF, the panel will examine strategies for responding to climate change at the national and local water utility levels. A draft U.S. Environmental Protection Agency National Water Program Strategy released in March will be included in the discussion. Confirmed speakers are Hon. Benjamin Grumbles, assistant administrator for water, EPA; Nancy Ahern, deputy director for Utility System Management, Seattle Public Utilities; and G. Tracy Mehan, principal, The Cadmus Group. This session will also be in Room S406a. The 81st annual Water Environment Federation Technical Exhibition and Conference will be Oct. 18-22 at McCormick Place in Chicago. WEF added a session to the conference on "Safety and Security Priorities at Wastewater Treatment Facilities, from 1:30 to 5 p.m. on Oct. 22 in Room N226. What makes this session special is a demonstration that will help convey the potential of a new tool, CS2SAT, in reducing cyber risk exposures, according to Session Moderator Alan Callier of Donohue & Associates. Water Environment Research Foundation Principal Investigator Candace Chan-Sands of EMA, Inc., will discuss tools and guidance on how to secure and protect automated process control systems, such as SCADA, including the examination of available technology to sense and correct security breaches. She will present and demonstrate the Control Systems Cyber Security Self-Assessment Tool (CS2SAT), tailored specifically for water and wastewater facilities to identify cyber security vulnerabilities, which assists systems users and vendors in assessing the security of their systems against the database of categorized security requirements. WERF, the Department of Homeland Security, EPA, the American Water Works Research Foundation, and Idaho National Laboratories collected the best available cyber security recommendations and guidance into a single database known as the Cyber Security Protection Framework. The presentation and demonstration will include how utilities have used the tool to reduce cyber risk exposures, and questions will be addressed during the concluding panel discussion. While WEFTEC does support two days of workshops and three days of technical sessions, the meeting is about a lot more. WEF's Student and Young Professionals Committee will kick off "green" activities on Oct. 18 by hosting the "Gettin out of the Gutter" Community Service Project. A collaborative effort between WEF, Chicago's Center for Neighborhood Technology, and the Illinois Water Environment Association Student Activities Committee, participants will work with the local community to construct rain gardens in Chicago's Pulaski Park. By preventing stormwater from entering the wastewater collection system, rain gardens provide an environmentally friendly method of reducing sewer overflows and recharging groundwater supplies. The noise in the exhibition hall can be loud when more than 200 of the world's best and brightest wastewater treatment professionals compete in Operations Challenge 2008, a fast-paced skills competition for wastewater operations and maintenance professionals. Now celebrating its 21st year, the competition will take place Oct. 20. The current champions, the Rocky Mountain Water Environment Association's Commode Commandos, will defend their title against the top regional teams (there are more than 40) from the United States, Canada, and Argentina. Three local teams are among the competitors in this year's event, including Chicago's own Illinois Water Environment Association's Windy City Wizards, Central States Water Environment Association Pumpers, and Central States Water Environment Association Shovelers. Chicago and surrounding area high school science teachers will be able to participate in a full-day, hands-on WEFTeach workshop on Oct. 20. The "train-the-trainer" program includes Sewer Science, a mobile classroom-sized wastewater treatment plant that challenges students to treat water to the same EPA standards expected of municipalities and the Ten Day Water Environment Curriculum, which covers the water cycle, wastewater treatment, and its relevance to the water environment. The conference also offers a major exhibition hall (see product preview) as well as plant tours. Chicago's McCormick Place, the premier convention facility in North America, is owned and operated by the Metropolitan Pier and Exposition Authority (MPEA) and attracts close to 3 million visitors each year. 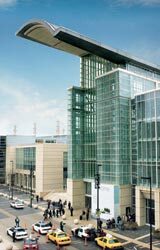 McCormick Place is comprised of four state-of-the-art buildings: the North and South Buildings, where WEFTEC will be located; the West Building and Lakeside Center. In its role as owner and manager of McCormick Place and Navy Pier, MPEA provides the city with Illinois' largest public art collection. The South Building collection features a chandelier by world-renowned glass artist Dale Chihuly and a mural of the Chicago skyline by tile artist Harri Aalto, as part of its more than 70 works of art.